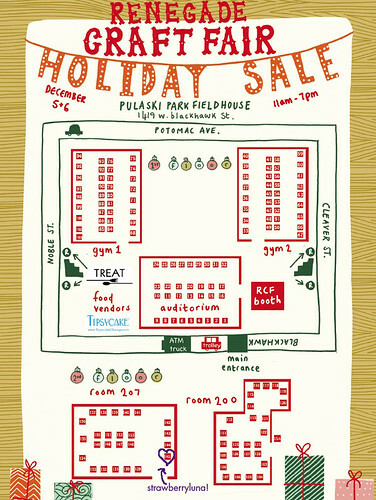 Renegade Craft Fair Chicago Holiday sale! Come see us! Hooraaay! It’s winter! And that means all kinds of fun, AND also the holiday craft fair season. Like Winter Markets in Europe, the holiday indie craft fair circuit is a growing and lovely trend here in the US. And we love it around here. Naturally! So, this weekend is yet another fantastic fair that we’ll be attending, it’s the Renegade Craft Fair’s Holiday Sale in Chicago, IL. Come see us and say hi! Mention that you saw this blog post and get a free gift or $5 off your purchases with us. strawberryluna will be upstairs in Room 207 at Table / Booth 145, no doubt drinking hot chocolate and talking with awesome folks like you. Click here or on the image below for a larger version of the Vendor Map. Come see strawberryluna at booth #145 in Room 207. We'll be rockin' the hot chocolate! Click for a larger version of this map too. Happy holidays and happy shopping with your favorite handmade artisans! For more information, directions, hours and dates again click here OR click the images above and below.